These quirky but charming villages would win anyone over before even stepping foot on their paradisiac beaches. 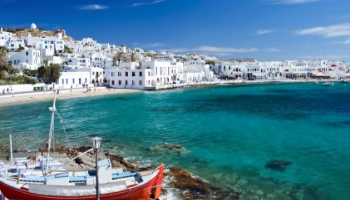 Known for its sophistication, Mykonos is one of the most cosmopolitan Greek islands. A spellbinding island with traditional white and blue apartments. 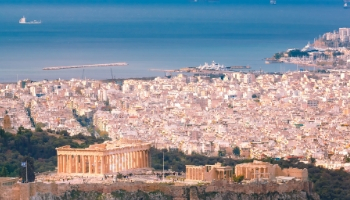 Located on the mainland, the birthplace of democracy and renowned for some of the world's greatest ancient landmarks. Enjoy wide stretches of beach, traditional whitewashed houses and the most picturesque views that ever met the eye. The smell of pine waves throughout the Sporades, as does the sound of nature. Charter a boat in Greece and experience the gorgeous mediterranean climate coupled with the warm glistening sea on an idyllic sailing holiday. Wherever you choose for your boat rental in Greece, we’re confident that you can find beautiful settings with charming Greek villages on every coastal corner. 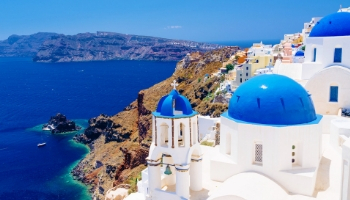 You can sail the Saronic Gulf and visit some of Europe’s most ancient heritage landmarks in the historical capital, Athens, or visit paradisiac islands and volcanic archipelagos such as the sensational island of Santorini in the Cyclades. Our boat rentals are based all over Greece. From the historical city of Athens, to island archipelagos dotted from left, right and centre. We also rent boats in the Cyclades, Sporades, Dodecanese and Ionian Islands, as well as the Saronic Gulf. You can rent sailboats, motorboats, catamarans, yachts, gulets and RIBs (Rigid Inflatable Boats) in our boat rental locations. Mooring fees are almost non-existent in Greece compared to other European destinations. On the occasion that you’re asked to pay a fee, it’s often no more than €20. 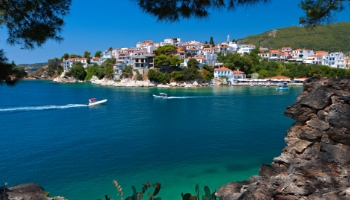 You can sail in Greece from May and experience mild temperatures in the low twenties. The temperatures peak in July and August with various areas reaching up to 30°C during the daytime. Athens can sometimes be rather overwhelming in August with its hot weather and tourism in full swing. Albeit, this might be much easier to remedy if you have a tranquil boat rental waiting for you at sea! If you’re sailing during the peak summer seasons, the key wind to know about is the meltemi wind. The meltemi, a northerly wind, generally picks up by June/July time and blows at its strongest in August. Areas such as the Cyclades Islands have more forceful winds due to the lack of mainland encircling the archipelagos. The wind force in the Cyclades is normally 5-7. Whereas, for example, in the Ionian islands the wind force ranges from 2-5. Unless an experienced sailor, we usually recommend sailing with a skipper. Not only do you have to worry less about weather and wind direction, but you can put your feet up and enjoy the view! A skipper is also a great way of learning more about sailing and can be a great option for beginner sailors willing to improve. Visiting Athens or sailing near the Attic Coast and Saronic Gulf? Your number one priority should be viewing the Acropolis and Parthenon. Athens is a historical landmark for Europe and still holds many of its ancient treasures and buildings. Its centre also has plenty of lovely bars, restaurants and cafes for refuelling after sightseeing! 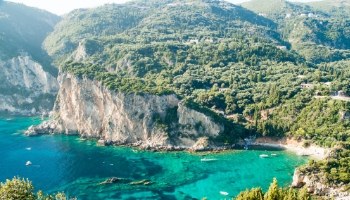 For the Ionian Islands, you can find party destinations such as Kavos and Corfu Town for those willing to party the night away or host a private boat party, yet there are also stunning beaches and quiet coves where you can unwind in the peaceful harmony of light waves against the pearl white sand with the scent of fresh sea salt. Tip: Myrtos Beach in Kefalonia is a personal favourite of ours! Islands off the eastern coast of Greece, for instance the Sporades Islands, are encompassed in gorgeous stretches of sand and pebbles where you can bathe and snorkel. The islands have their own fair share of historical buildings, churches and fortresses where you can lose yourself in Grecian archeology and architecture. 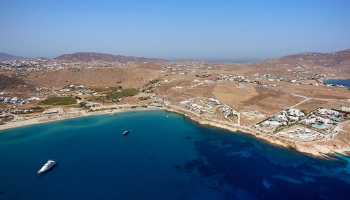 The Cyclades possess vibrant towns with plenty of nightlife in the summertime, as well as unique landmarks such as the windmills of Kato Mili in Mykonos. Santorini’s blue domed churches are postcard perfect against the shimmering sea, though this island is also renowned for its wine, due to the fertile earth of the island.